On the heels of one affordable housing controversy after another, a partner of one of Clinton Township’s seven affordable housing projects has been indicted by a Hunterdon County Grand Jury. NJ.com reported that in January 2015 Wilson’s license to practice law was suspended “after he failed to supply the New Jersey Office of Attorney Ethics with requested information on clients and attorney trust accounts.” Wilson was representing Hunterdon Humane Animal Shelter at the time he was suspended. Wilson was disbarred by the State Supreme Court in November 2016. Walter Wilson is a partner in Kerwin-Savage, a New Jersey General Partnership based in Bernardsville, New Jersey. The partnership’s Alton Place Development has been designated by the township as one of seven housing sites to fulfill its obligation to construct 373 new affordable housing units. A general partner of the concern, Michael Savage, confirmed Wilson’s involvement to the township in a February 1, 2017 letter. The date on the letter is February 1, 2017, but the signature is dated January 30, 2017 — the same day the partnership apparently met with Mayor John Higgins to discuss its Alton Place development. 108 Alton Place is slated for 28 affordable units. Inclusion in Clinton Township’s plan gets the developer a bonus — high-density rezoning of the property for 10 units per acre so it can build an additional 110 market-priced housing units. Such high density would never have been possible for the site without inclusion in the township’s affordable housing plan, and is considered a windfall for a lucky landowner or developer. After being suspended and disbarred but before his indictment, Wilson testified in New Jersey Superior Court in a January 29, 2018 court filing about details of his Alton Place affordable housing site’s inclusion in Clinton Townhship’s affordable housing plan. Even after the massive housing deal was approved by the mayor and council, they conducted no public hearings about it in council chambers. Instead, Mayor Higgins told concerned residents they had to go to court in Somerville, NJ if they wanted to make comments or objections — but only after filing their comments and objections in writing to the court. The court approved the settlement deal on March 23, 2018. According to township e-mails obtained under the New Jersey Open Public Records Act (OPRA), a year earlier, on January 18, 2017, Kerwin called Mayor Higgins to request a meeting “to discuss [Kerwin’s] interest in developing Alton Place.” Higgins e-mailed Kerwin agreeing to the meeting as long as attorneys from both sides were present. After Higgins replied again that he would meet only if attorneys were present, Kerwin agreed and the meeting was scheduled (and presumably convened with attorneys) for January 30, 2017 at 6:00 pm. 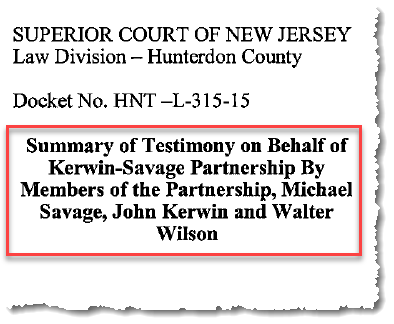 It was on the date of the meeting that the Kerwin-Savage partnership signed the disclosure that Wilson was a partner. Mayor John Higgins met with Kerwin-Savage to discuss inclusion of the partnership’s Alton Place site in Clinton Township’s affordable housing plan, knowing Wilson was a partner. Higgins and township attorney Jonathan Drill presumably negotiated with Wilson’s partnership. Higgins and the council approved the plan and settlement including Alton Place. Wilson and his partners testified to the court about Clinton Township’s affordable housing plan and settlement with FSHC. The court approved the deal. Wilson’s license to practice law was suspended. The township’s beleaguered affordable housing plan continues to cough up controversies, including “unusual” problems with its largest designated affordable housing site that’s scheduled to receive 400 new housing units (see Mayor’s #1 affordable housing builder has “unusual” problems). Kerwin-Savage requests meeting with Mayor Higgins to discuss Alton Place affordable housing site without attorneys. Clinton Township council approves affordable housing settlement deal with FSHC which includes Alton Place property — without public deliberation or disclosure of what was in the deal prior to voting on it. Kerwin-Savage submits testimony — including partner Walter Wilson’s — to Superior Court about Clinton Township’s affordable housing plan and settlement. Court approves affordable housing settlement deal, including Alton Place. This is not Clinton Township’s first controversy about lawyers in the matter of its affordable housing planning. This entry was posted in Affordable Housing, COAH, Municipal, Sprawl, State, Windy Acres and tagged affordable housing, Alton Place, Higgins, Kerwin, Walter Wilson. Bookmark the permalink.